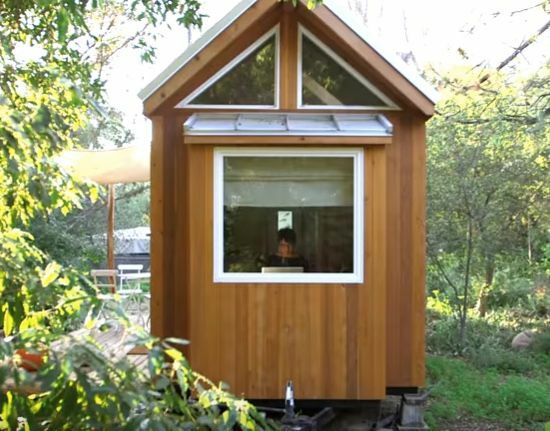 Vida Lustado’s dream home might not be everybody’s idea of perfection. 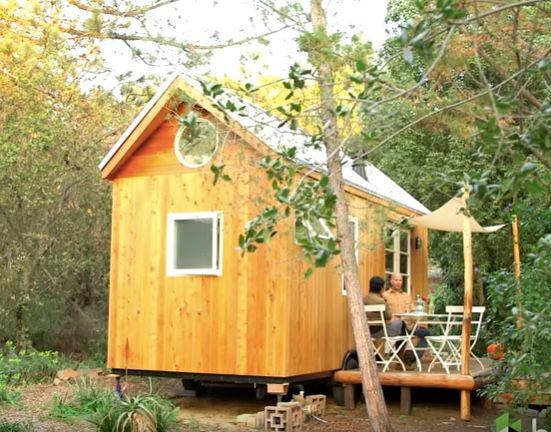 Occupying just 140 square feet, it’s part of the “tiny home” revolution of domestic downscaling. Like others singing the praises of the “tiny life,” Lustado proves that looks can be deceiving. 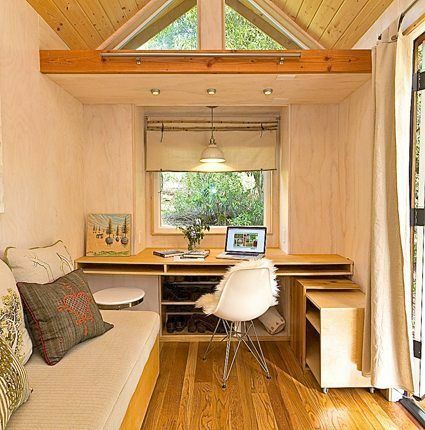 Believe it or not, many of the amenities associated with larger structures can be enjoyed within the smaller footprint of a tiny home. 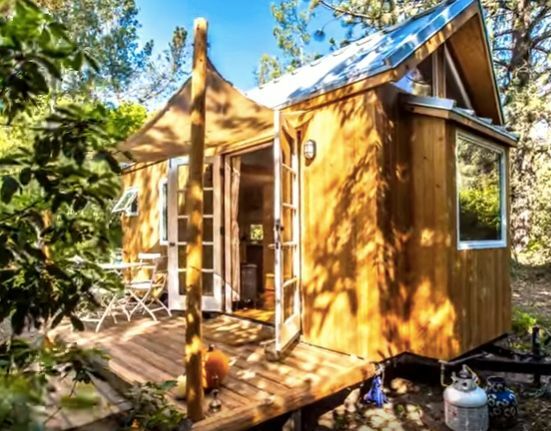 It turns out that smart design, efficient multipurposing and the distillation of one’s belongings down to mostly essentials allow for tiny-home owners to live their best (though admittedly not their biggest) lives. Lustado’s chic, red west cedar residence’s exterior is all about a clean modern aesthetic sensibility. The same sensibility informs its interior. 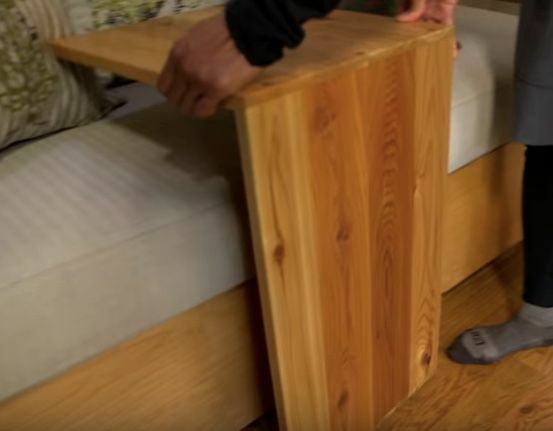 The home's great room features a modular sofa that (with sheets and a pillow or two) can allow for the space to become a guest bedroom when Lustado has company. 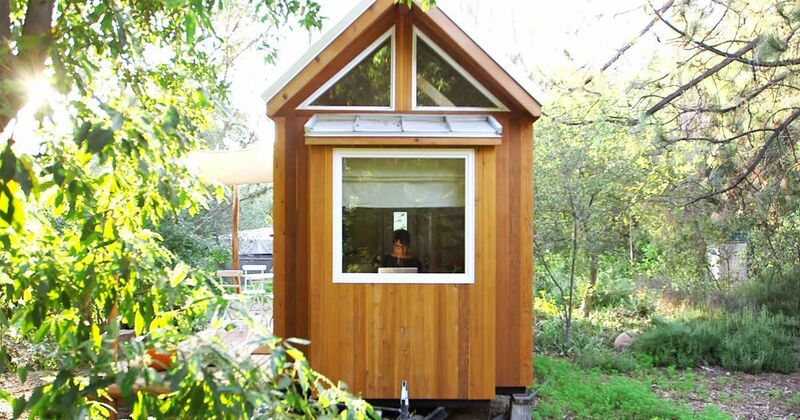 The office at the end of the great room enjoys full-day, natural light via a large window. ...can be used for casual dining while seated on the sofa. 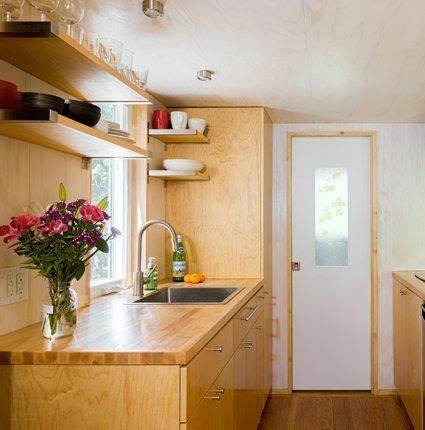 Lustado says her galley-style kitchen has more space than those she had in the home's she has rented. 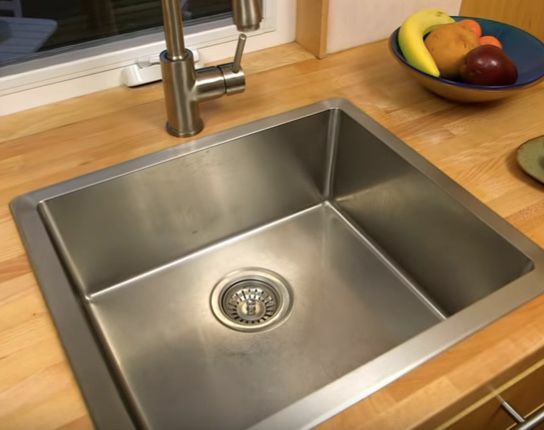 The deep, stainless steel sink can hold plenty of dirty dishes, pots and pans after use to keep the counter clear. A small fridge probably means using the freshest of produce. It’s all part of “greener” way of living. 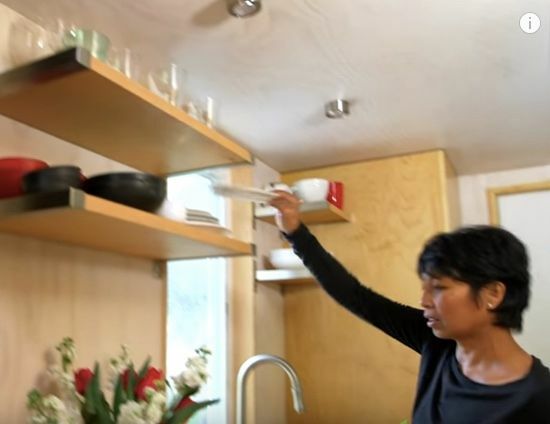 Dishes are stowed up high on open, floated shelves that take advantage of vertical space. 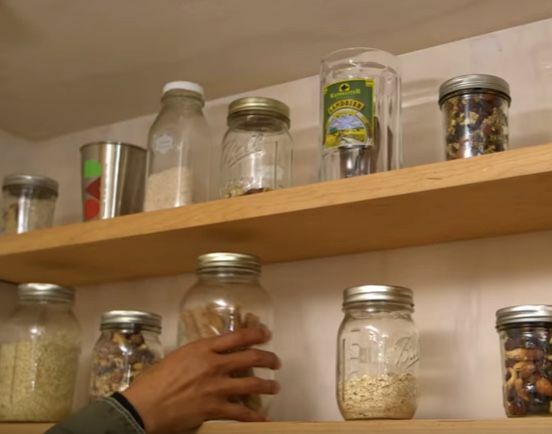 On the other side of the galley-style kitchen’s aisle, mason jars house dry food on another set of floating open shelves. An armoire-style closet – accented with charming maple leaf motifs – neatly houses Lustada’s edited wardrobe of versatile staples. 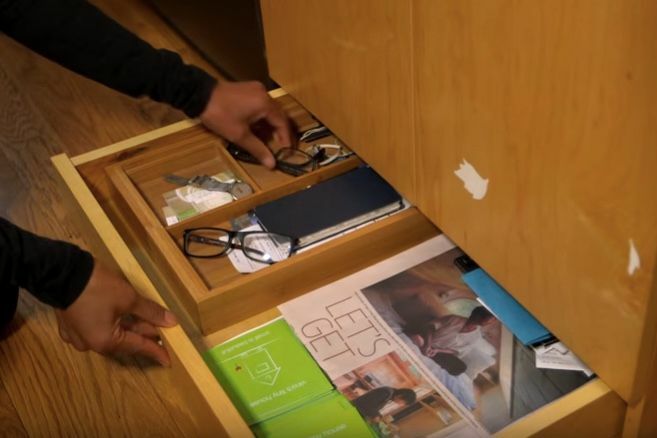 Personal items are discreetly stored in its low, concealed drawers. 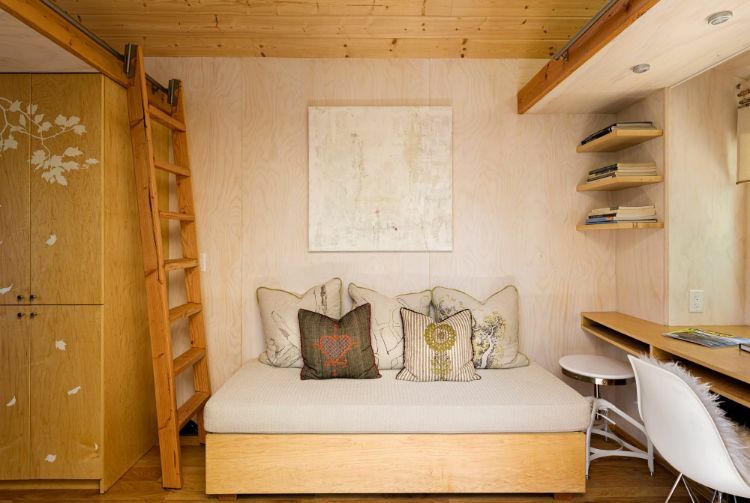 To the right of the armoire-style closet, a ladder mounted on caster rails can be pulled out, allowing access to the home’s sleep loft. 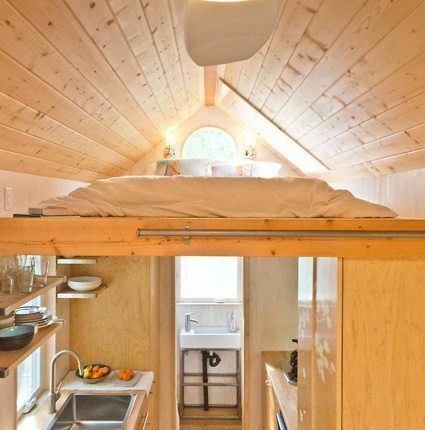 The sleep loft, which is 10 feet long, has a skylight that allows for evening views of the stars and morning peeks at singing birds. 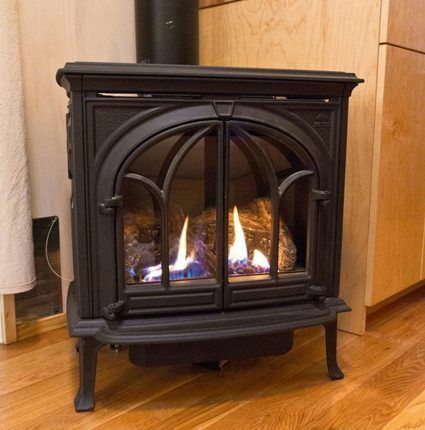 A single propane fireplace in the main living space easily provides warmth for the entire home. 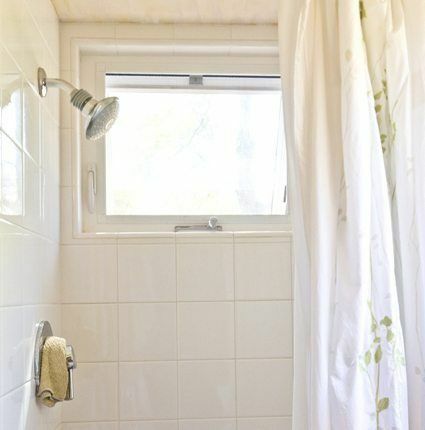 The stand-up shower’s white tiles and chrome hardware accents are in perfect alignment with the home’s clean, modern and minimalist interior. When Lustado and guests need a bit of elbow room, they can venture out onto the home’s deck for seated conversation or casual dining. She shares that use of the deck essentially doubles her living space.